Enterococci are gram-positive cocci which often occur in pairs (diplococci), initially classified as Group D Streptococci until genomic DNA analysis indicated that a separate genus classification is appropriate. They are common commensal organism of human intestine and female genital tract. Two species are most commonly involved in human infections: E. faecalis (90-95%) and E. faecium (5-10%). From a medical standpoint, the most important feature of this genus is their propensity to develop antibiotic resistance. And hence it has become the leading cause of nosocomial infections. Clinical conditions caused by this potential pathogen include urinary tract infection, bacteraemia and endocarditis, wound infection, and intra-abdominal and pelvic infections. It has become resistant to many and sometimes all standard therapies. Recent surveillance reports are highlighting the importance of examining enterococcal isolates at species level. 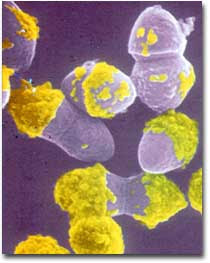 Although relative proportion of infections caused by E. faecium is low, the incidence of resistance is high in this species i.e., Enterococcus faecalis, still retain sensitivity to at least one effective antibiotic but E. faecium, are more likely to be resistant to even antibiotics of last resort. Hence species identification and antibiotic susceptibility test play a major role in treating enterococcal infections.